Sir Arthur Conan Doyle’s Sherlock Holmes tales are rightly ranked among the seminal works of mystery and detective fiction. Included in this collection are all four full-length Holmes novels and more than forty short masterpieces—from the inaugural adventure A Study in Scarlet to timeless favorites like “The Speckled Band” and more. At the center of each stands the iconic figure of Holmes—brilliant, eccentric, and capable of amazing feats of deductive reasoning. By his side is Dr. John Watson, his steadfast assistant and our trusty narrator. This set is a must-have for every discriminating bibliophile and Sherlock Holmes fan. Public Domain (P)2013 Brillance Audio, all rights reserved. I purchased the Kindle version of this 4-volume Complete Sherlock Holmes set before this was available. Hopefully, Amazon will Whispersync this pair some day. In the meantime I hope that this TOC outline will help some listeners find particular stories they might be looking for. The Audible Part/Chapter Notes refer to the 7-part download. My setting is for downloading in one file, but on very large volumes Audible breaks them up anyway. My notations for (Part # Chapter #) refer to the Audible download "Part" and the "Chapter" within each part. This enormous collection of the whole original Sherlock Holmes canon is read by Simon Vance from the 1887 edition of ‘A Study in Scarlet;’ 1890 ‘Sign of Four;’ 1891 ‘Adventures of Sherlock Holmes;’ 1892 ‘Memoirs of Sherlock Holmes;’ 1902 ‘The Hound of the Baskervilles;’ 1903 ‘The Return of Sherlock Holmes,’ 1914 ‘The Valley of Fear;’ 1917 ‘His Last Bow’ and 1927 ‘The Casebook of Sherlock Holmes.’ In short the whole collection of Sherlock Holmes stories by the original author is contained in this audio production, not only the best adventures of Sherlock Holmes but every single one of them. It adds up to more than 56 hours of listening time. By adding Simon Vance’s voice to the complete collection of Sherlock Holmes stories, you don’t only get to listen to all the stories about the great detective. Vance has been awarded 10 Audie awards and 48 Earphone awards and has over 30 years of experience in recording audio books as a voice artist. He is an excellent narrator who has the ability to enliven the world of the narrative, helping you live through every moment of suspense, violence and intriguing detective work. In ‘The Complete Sherlock Holmes: The Heirloom’ the master of freelance crime investigation is paired with a master of voice. It becomes extremely affordable when you pair this powerful combination with an Audible credit. It is one of those quality bargains you should not resist! Simon Vance is the perfect narrator for Holmes; I was hoping he'd do them someday, and now suddenly out of nowhere he's done all of them. Absolutely no complaints about the narration. I recently listenend to all the stories read by Derek Jacobi, and now I'm in the process of listening to them again. As always, Vance's perfectly modulated voice brings out nuances I've missed, despite having read (and listened to) the stories many, many times. Despite the crime-solving framework, these really aren't plot-driven stories. What I enjoy more than anything - and the thing I remember most vividly - is the wonderful variety of characters that inhabit this world. Holmes is at the top of the list, but Watson has his own charm and mystery (not the least of which is the way his war wound moves around). And the clients! Jabez Wilson. All the women named Violet. The wonderful thumbnail sketch of the budding young psychopath in "The Copper Beeches." The dying John Turner. Mycroft. Stapleton. Barrymore and his wife. And to top them all off, the dog in the night-time. The stories are not all first-rate. I could do without most of the stories in "The Casebook of Sherlock Holmes," and there are a couple of duds in the earlier collections. But even some of the duds - like "A Case of Identity" - have a fascinating character study at their core. And the duds are outnumbered by one tightly-packed gem after another. My only complaint is the same one others have mentioned: the way the books have been divided up across the files. It would have been convenient if the series were grouped into files by book rather than by an arbitrary file length. But that's really a minor quibble, and in any case it may change if the publisher listens to feedback. It doesn't affect my rating. If you're on the fence about which Holmes collection to get, get this one. The Original. Still the Best. You will not find a better audio version of these works anywhere, and the only competition this collection has is the print equivalent. For a single credit? This is more than a bargain; it's a steal. This is Holmes and Watson, in their original forms, as products of their time and place, unabashedly Victorian and ahead of their time right from the outset, regardless of how many religious groups or racist cults they anger in the process. There is nothing remotely politically correct about them, and in the case of Holmes himself, it would be completely against his abrasive character to be toned down. The result is that you get some screwball historical curiosity mixed in with the otherwise astounding adventures within this collection. For those well-versed with the classic canon, I did notice that "The Adventure of the Cardboard Box" is posted later, within His Last Bow, rather than within The Memoirs of Sherlock Holmes. Look up Memoirs on Wiki for the story behind that, but suffice to say, it does mark this collection as an American edition. Seems wrong for something so British, but hey, if this is the worst thing I can say about this collection, that makes me a very happy fanboy. My hardcover leatherbound collection has the same issue, so I kind of expected it. Note to self: fix that someday. As narrator... I could not ask for better than the great Simon Vance, save for maybe a resurrection of TV's Jeremy Brett. Even then, it's a toss-up. Vance is one of my favorite Audible narrators, and I've had his voice along for more modern Holmes short story collections. As both Holmes and Watson, he is perfect. He also does an amazing job juggling the other characters and their myriad accents throughout the stories, bringing the tales of the Great Detective to uncanny life. If it were possible for him to play Holmes' violin during the recording, I half expect he'd try it. As it is, I can almost hear it anyway, such is the quality. Collections like this will always affirm for me that no matter who tries to modernize them to make them somehow "more relevant," the truly great stories and characters, especially of this caliber, are beyond reproach and beyond improvement. 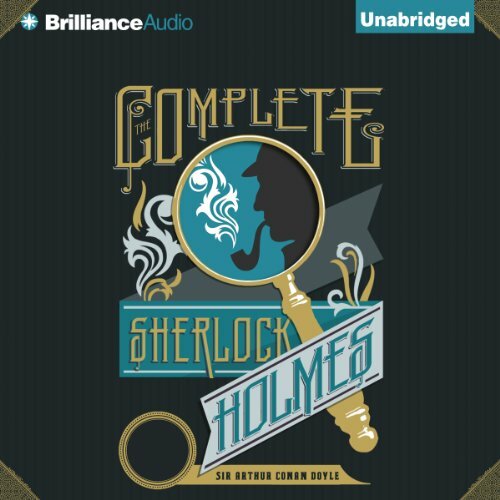 Would you consider the audio edition of The Complete Sherlock Holmes to be better than the print version? No, but that is almost impossible. Any reading is just a reading of a masterful work. There are many artists who recorded the various Sherlock Holmes novels and short stories. An there will be more, but Simon Vance is the best that I've encountered yet. My only complaint is that this is one file. You won't be able to go to a specific book or short story. This is 58 hours in one file. This would have been much better as 9 works, each with chapters. Still, this is a good way to listen to all the books beginning to end. Of course I love Sherlock. But a great thing about this edition is that the books are in chronological order, which makes it easy to distinguish between the crisp analytical Sherlock of the late 19th century and the more philosophical moralizing Sherlock of the 20th. The reader was perfect for the part. Can you ask for anything better than the complete Sherlock Holmes collection narrated by Simon Vance and for just one credit. When I found this selection it went immediately into my wish list and downloaded as soon as my new credit came up. I have not had time to listen to all 58 hours yet, but have been skipping around, sampling old favorites, starting with "A Scandal in Bohemia". Holmes has never sounded so good. For Sherlock fans this is a must. As other reviewers have noted, the downloads do not give the names of the selections - just chapter numbers. But thanks to reviewer "Santa Fe Painter" the table of contents for each download part is listed. I did a cut-and-paste and printed out this list for reference. I did note that the numbering on his list is slightly different from how my download appears - for each download part, where his list says Chapter 2, make it Chapter 1 and adjust the numbering from there. Then off you go - the game's afoot! I need an index of where the stories are otherwise you cannot argue with the greatness of Sherlock nor Simon Vance's performance. What made the experience of listening to The Complete Sherlock Holmes the most enjoyable? What could be more perfect? The brilliant Arthur Conan Doyle and the impeccable Simon Vance. What was one of the most memorable moments of The Complete Sherlock Holmes? Simon Vance is the perfect narrator. He is so talented and so good in the narration of his characters that no one else could do this work justice. If there is a genius narrator, Mr. Vance is it. If you are a Holmes fan, I don't have to say it. You already own this book! Simon Vance captures Victorian England superbly, as I've recently learned in his work in Dickens. Fifty two hours is a long time to pay attention to a narrative but don't let that dissuade you from giving this a go. The audiobook contains many different stories that are usually 30 - 120 minutes in length so everything can be broken down into much smaller chunks. Audible has also sliced the book into seven downloads so it doesn't fill your device for months on end. I listen most days for about thirty minutes and it has taken me about five months to get through it and I'm very pleased I did. The whole book is narrated by Simon Vance who is, as you would expect, wonderfully versatile as his craft. The distinction between the characters is very clear but the main vocal contrast between the two main characters - Holmes and Watson is perfectly pitched. Vance's Sherlock booms with confidence, mischief and intrigue whilst Watson semi-simpers three paces behind his better, hoping that Holmes will propose and they can run off and keep bees together on the South Downs. Vance's remarkable vocal talent is not to be glossed over and only the imperious Jim Dale could produce the wide range of voices needed for this book. The stories themselves are mostly well known and Conan-Doyle’s crown jewels such as Hound of the Baskervilles and A Study in Scarlet or The Sign of the Four are brilliantly realised but many of the lesser known treasures really do come to life. Some of the language is now archaic and sometime a little unpalatable particularly on subjects of race or religion. One should remember that most of the stories are well over a century old and the world has turned since. However the archaic language provides some laugh-out-loud moments for a puerile mind such as my own - Watson will constantly 'ejaculate' his exclamations and one scene sees a lady arrive at Baker Street on a cold, damp evening where she proceeds to pull and handkerchief from her muff and blow her nose on it - all perfectly innocent but very snigger-able is the mood takes one. There is a downside and it's a technical one. The producers of the book or Audible have labelled each of the chapters numerically which fulfils a function but could be so much better over a long book such as this (or indeed any book). The audiobook standard allows for chapters to properly names and it would have been great to have each chapter named according to the story being read. A couple of times, my MP3 player has dropped my position and it has taken me a long time to find it again. Properly labelled chapters would really help this and it wouldn't take much extra effort from the people producing the books. This is THE download of your ENTIRE - LIFE. If you read, you need this download. There are other complete Sherlock Holmes - they're badly read. Simon Vance is why God invented audiobooks. I actually look forward to listening to this again. It is a pleasure to listen. Essential for any Holmes fan! Where does The Complete Sherlock Holmes rank among all the audiobooks you’ve listened to so far? This is the best audiobook I've got so far - absolutely captivating and it really captures the flavour of the original, legendary, stories. One of my favourite collections, I wasn't sure this would translate well to audio but have been pleasantly surprised and it feels like discovering them all over again. Excellent performance - capturing Holmes and Watson very well - without making any real effort to "act" the parts. His voice is a perfect vehicle for these stories. No chance! This is an audiobook that I will be dipping in to for a long, long time to come! Highly recommended - whether you have read Conan Doyle before, or not! This audiobook is superb! I'm new to Sherlock Holmes but am now a convert and intend to read all the stories. Sherlock is a great literary creation, who it seems has not been done justice by the various TV and films I've seen. I've had this on while decorating the house for hours on end and I'm just not tiring of hearing of Holmes' and Watson's adventures. The narrator has just the right voice and he does a great job of bringing the characters to life, particulalry Holmes. For stories and narrator performance this is the best audiobook I've bought so far. Add to that the superb value and you just can't go wrong. If you have been disappointed as some other listeners have by other readings of holmes with "unusual" accents or pronunciation, give this a try. What did you like most about The Complete Sherlock Holmes? What other book might you compare The Complete Sherlock Holmes to, and why? There's nothing quite like the orginal Holmes stories....there are many imitators, but that's not quite the same thing now, is it? Vance's performances are uniformly excellent and were the main reason for me choosing to re-visit the Holmes canon in audibook format. I first came across his work many years ago in a performance of Arturo PerezReverte's "Purity of Blood" and since then I've yet to be disappointed by anything of his to which I have listened. Holmes stories are many things to many people but I can't really imagine any of them being described as 'moving'. This is not a fault, in my opinion. To use a much-overused phrase "they are what they are". Would you listen to The Complete Sherlock Holmes again? Why? I listen to the this complete collection over and over again. I find something different everytime and have now bookmarked each chapter so I can find my favourite stories eaaily. Simon vance is brilliant and really brings these amazing stories to life. The hound of baskervilles and charles august milverton are memorable stories..
Simon vance voice acting is brilliant and I now deliberately listen to books he has voiced as he brings the books to life. Even though the Sherlock Holmes stories are familiar to almost everyone through the printed page, films and TV series, the audiobook is a new and refreshing way of experiencing them. Great on car journeys and good value for one member credit: the quantity of material will last for many miles! Surprisingly, Dr Watson, who emerges as a sympathetic and emotional character. Simon Vance has a pleasantly mellifluous voice and distinguishes between the dialogue of the different characters effectively but without overdoing the changes of timbre and accent. Just enjoyable to follow the plots. Yes - In fact after listening to it for a second time currently (after a 4 month gap) as they are the kind of stories you can listen to time and time again! Sherlock obviously - brilliant character and Watson is just a little to stupid to be a favourite! Impossible to pick one moment from the entire works!! The individual characterisations were well maintained. The authors language is just beautiful and the narrator, Simon Vance, made a spectacular performance with perfection. I am tempted to listen to the entire 58 hours again and most likely will. Thank you for making such wonderful material so much more accessible. loved it! the narrator is awesome speaking in different voices and with different accents. Some of the stories I knew, but most were completely new to me. Simon Vance reading every one of Conan Doyle's Sherlock Holmes! I brought it immediately and have no regrets. I loved this audiobook. Simon Vance was the perfect narrator for Holmes and Watson's adventures. It was such a treat listening to the entire collection and I really recommend this title - great value for money! I will definitely go back and listen to this again at some point. A regular audible listener I originally came across this when a new Sherlock Holmes release performed by Stephen Dry hit my suggestion box. Normally I am a non-fiction listener but enjoyed Sherlock Holmes as a teenager or young adult and listened a sample. I found Stephen Fry's performance however somewhat not quite to my liking. Partly because I preferred a faster rate of speech (maybe he was 'acting' it a bit much for me) but mostly I found the reading a bit 'modern' perhaps in accent also. It maybe have been influenced by my visualizing it having seen some of his acting. Further searching found Simon Vance's reading. Immediately faster but also having a somewhat more period feel with an educated and perhaps more aristocratic tone. I realized later that he has read countless other works and in his sample (and full performance) I found myself experiencing the world in the way I liked. Reading other characters in the right tone without distracting 'acting' that might be tempting to some. Overall Arthur Conan Doyle's works are a masterpiece (really the founding of all the modern crime shows on TV) and performed faultless with congruency to what I would imagine a perfect reading would be. Perhaps for those reading (listening) to this for the first time might prefer a different voice. But there are other readings on audible for Sherlock Holmes. I found this to be the best. Try the sample before choosing. Of course with membership also it is a bargain. Very famous and interesting stories told in the language of the times. definately worth the long read. Really enjoyed the series, loved the English language as it used to be. Narrator great. Such a talented reader! and he did different voices for all the characters. I think it took me a month, maybe more... to get through the whole thing. And that was listening to 2-3 hours pretty much every day. Great value at $15!!! The narrator's voice and style suited it so much. Made me hesitate to get off the bus in the mornings!